High As contents in groundwater were found in Rayen area and chosen for a detailed hydrogeochemical study. A total of 121 groundwater samples were collected from existing tube wells in the study areas in January 2012 and analyzed. Hydrogeochemical data of samples suggested that the groundwater is mostly Na–Cl type; also nearly 25.62 % of samples have arsenic concentrations above WHO permissible value (10 μg/l) for drinking waters with maximum concentration of aqueous arsenic up to 25,000 μg/l. The reducing conditions prevailing in the area and high arsenic concentration correlated with high bicarbonate and pH. 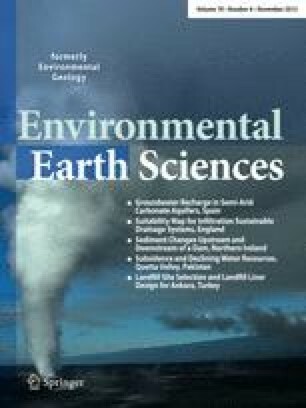 Results show that arsenic is released into groundwater by two major phenomena: (1) through reduction of arsenic-bearing iron oxides/oxyhydroxides and Fe may be precipitated as iron sulfide when anoxic conditions prevail in the aquifer sediments and (2) transferring of As into the water system during water–acidic volcanic rock interactions.